One thing I love about Twitter is seeing all the announcements of new books. Authors and agents excitedly share the news of their new contracts and fans retweet info about their favourite author’s upcoming books. Each year, I try to find a balance between reading new releases and reading backlist titles. And, each autumn, I spend a little time looking ahead to which new books are coming out in the new year. (Romance) Who else gets grabby hands around every new reimagining of Pride and Prejudice? This one is set in modern day Pakistan. It tells the story of the Binat family. Alys, the second daughter in the family, teaches English literature to girls, hoping to inspire them to dream of more than dropping out of school to get married and have babies. When the family gets invited to the biggest wedding their town has seen in years, it sets of a flurry of activity — maybe just maybe some of the girls will catch the eyes of some of the rich men attending. Unmarriageable comes out January 15, 2019. (Romance) This book is by the author of The Hating Game which I adored! (I’ve blogged about it a few times.) 99 Percent Mine is about Darcy who has been in love with her twin brother’s best friend Tom since they were eight-years-old. And now, Tom is in her tiny cottage, inherited from her grandmother, renovating it so that her brother can sell it. Can Darcy finally get Tom to notice her? And can she save grandma’s cottage? 99 Percent Mine comes out January 29, 2019. (Young Adult) Angie Thomas’s first novel, The Hate U Give, has been on the New York Times Best Seller List for 87 weeks at the time of this writing. Her new book, On the Come Up promises to be just as real and hard-hitting as THUG. It tells the story of Bri, a sixteen-year-old girl who wants to be the best rapper of all time. But, with bills piling up after her mom loses her job, instead of being able to focus on her rhymes, Bri has to try to figure out how their family can avoid homelessness. On the Come Up comes out February 5, 2019. (Young Adult) Again, I loved the first book in this series. Geekerella was a retelling of Cinderella set all around a Comic Con like event about a sci-fi series. And this one is a retelling of The Prince and the Pauper. But with fangirls and romance. It is sure to be fun and awkward and really, really cute. 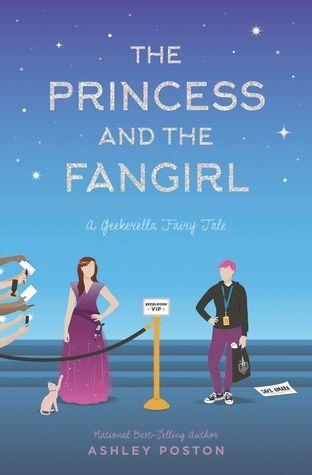 The Princess and the Fangirl comes out April 2, 2019. (Romance) Helen is a fabulous own-voices author who writes characters who are on the autism spectrum and who are trying to navigate romance. I loved her debut The Kiss Quotient and am excited to read this new story about Khai who feels like he’s defective when it comes to emotions and Esme, the girl his mom brings back from Vietnam to meet her potential husband. The Bride Test comes out May 7, 2019. (Young Adult) This new book by the author of When Dimple Met Rishi is sure to be sweet and funny and adorably romantic. Ashish and Sweetie are both Indian-American teens. They are paired to date by their parents. Ashish is a character returning from Dimple. Sweetie is a whole new character. She’s smart, and talented, and…fat. Which her parents see as the kiss of death. But she’s determined to show that she’s perfect just the way she is. There’s Something About Sweetie comes out May 2019. (Young Adult) This second book in Of Fire and Stars series continues the story of Denna and Mare, two princesses who are in love and on a quest to travel, in secret, to get Denna training to help her tame and manage her magical skills. I really enjoyed book one in the series. Of Ice and Shadows comes out August 13, 2019. (Middle Grade) This is another sequel. This time, it’s a graphic memoir series for kids and tweens. The first book, Real Friends tells Shannon’s real story about bullying and how friendships can change. Best Friends continues her story where the first book left off and shows the rollercoaster that is junior high. Best Friends comes out August 27, 2019. (Fantasy) This was one of my anticipated reads in 2017… but it was delayed. I’ve written about it a few times. But, I’m hopeful that it is actually going to come out soon since it’s available for pre-order on a few book retailer’s websites. The Thorn of Emberlain is the fourth book in the Gentlemen Bastards series about a group of conmen in a fantasy world. The series focuses mostly on Locke Lamora, who became a pirate and conman and thief when he was a young boy, and his friends. The Thorn of Emberlain may be coming out in September or November 2019. Well, there you have it. 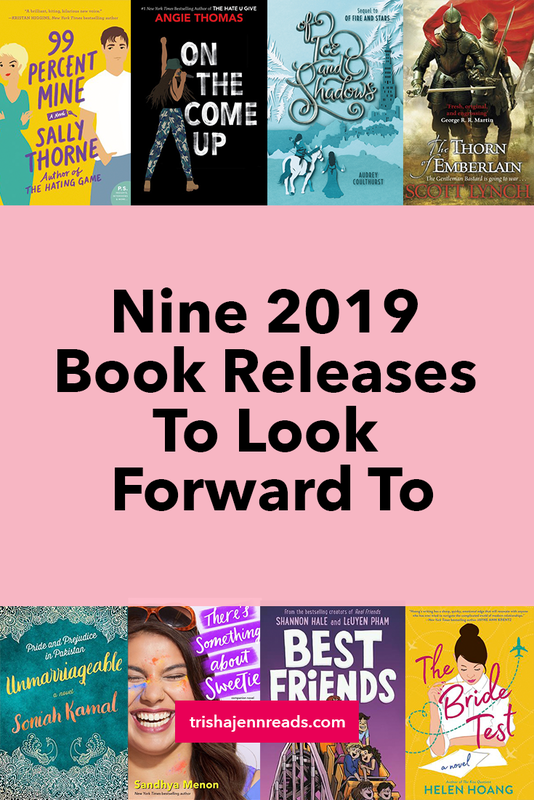 Nine books I’m looking forward to seeing on the shelves (and reading!) in 2019. If you’re interested in pre-ordering any of these books, consider ordering from Book Depository. If you use my affiliate link, you not only get great discount prices and free worldwide shipping, you also help support this blog. If you order through my Book Depository link, I will receive a small percentage of the sale. This does not impact the price you pay. I’m definitely looking forward to the Helen Hoang and Sally Thorne – they’re going to be so good! And I think that Pride & Prejudice adaptation will be right up my alley.